Quick Reads have always been among the most popular titles chosen by people taking part in Reading Ahead. Now there are six more brilliant titles to choose from. Enjoy! 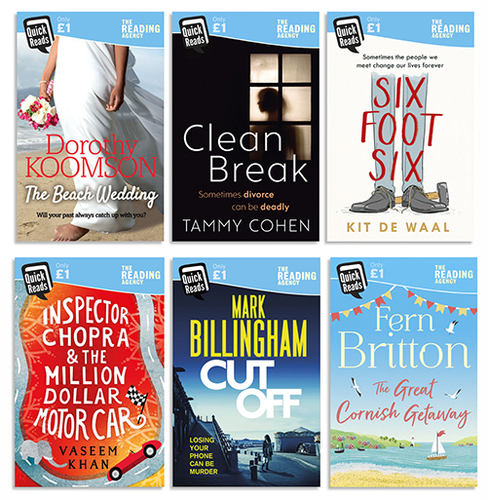 The Great Cornish Getaway by Fern Britton: As the sun sits high in the sky over Cornwall, and the sea breeze brings a welcome relief to the residents of the seaside village of Trevay, a stranger arrives in need of a safe haven. Clean Break by Tammy Cohen: A dark and twisty portrait of a marriage coming to its bitter end, from the mistress of domestic noir. Can Kate rid herself of her jealous husband before it’s too late? Inspector Chopra and the Million-Dollar Motor Car by Vaseem Khan: An enchanting Baby Ganesh Agency novella from the bestselling Khan set in the bustling back-streets of Mumbai. The Beach Wedding by Dorothy Koomson: A gripping short read featuring a wedding, family drama, and old secrets. Tessa is thrilled when her daughter arrives in Ghana to get married but memories of the last time she was there haunt her; can she lay the ghosts of the past to rest or will they come back to haunt her daughter’s future? Six Foot Six by Kit de Waal: A charming novella from Costa First Novel Award shortlisted author de Waal about finding friendship in the most unlikely of places. Everything changes for Timothy, a 21 year old with learning difficulties, when local builder Charlie calls on him for help. Cut Off by Marl Billingham: A punchy, taut urban thriller about that moment we all fear: losing our phone!